There has been plenty of talk in recent years that the now traditional ANZAC Day matchup of Collingwood v Essendon should be shared amongst other clubs. The publicity and buildup to the game, as well as the game itself, has now become so pronounced that the other clubs in the AFL feel as though they are missing out and want in on the action. There is one common misconception by the public in terms of the ‘tradition’ on ANZAC Day. That is the fact that Collingwood and Essendon have only had this honour since 1995. Before then it was shared amongst the teams of the AFL, the first ANZAC match was played in 1960, the greatest crowd (before the Collingwood/Essendon matches) was 92,436 in a match between Richmond and Collingwood. The attendances only dipped below 70,000 when the MCG was going through redevelopment, other than that there has been a stellar crowd at every Collingwood/Essendon ANZAC match. The question is, why would you take this away from two teams that have made it so successful? My answer is – you wouldn’t. One of those two teams, if not both, are a part of each of those fixtures with 10 of those being the two teams against each other. Fremantle has held an annual Len Hall ANZAC Day match over in Western Australia since 1996, however it has never been against the same team each year and as such has garnered nowhere near the attention that the Essendon/Collingwood one does, however it does have considerable sway in WA. A simple action to take that game to the next level would be to make that game the West Coast v Fremantle game and make it WA centric. Crowd will be larger, intensity higher and atmosphere electric. In regards to other teams, the AFL attempted a doubleheader at the MCG in 1986 where the total crowd for the day was just over 40,000 and how many supporters would remain after the Collingwood/Essendon game, how would the flow of people into and out of the MCG work, ticket sales, prices, monitoring of tickets etc? There won’t be a doubleheader again anytime soon, that’s for sure. 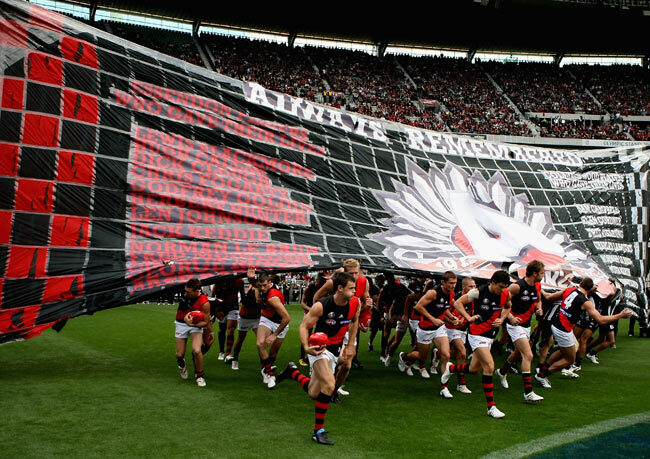 Essendon and Collingwood will maintain their stranglehold on the ANZAC Day match, they have put in the work and have reaped the rewards and continue to put on an amazing spectacle each year. The other clubs are now only seeing the potential in the game and greedily want some for themselves. Slightly disrespectful if you ask me, which is another reason it should remain the same. Collingwood and Essendon put in the work to make it a massive occasion for remembrance, respect and great footy, if you change the ‘tradition’ simply because other teams want in on potential profits and publicity then all the work done by these two footy powerhouses will be nullified. This entry was posted in Football (AFL) and tagged AFL, Anzac Day, ANZACS, Collingwood, Essendon, James Hird, Kevin Sheedy, MCG, Mick Malthouse. Bookmark the permalink. Excellent information and facts! I have been seeking something similar to this for a long time now. Many thanks!